Lately I’ve had the urge to stitch small things. Since I went through something of a slump recently I decided that whatever gets me stitching is fine right now. I am trying to focus on Noah’s Sub and finally finish it this year but I’ve been rotating in small pieces also. The other night I started Just Nan’s “Once in a Blue Moon” class kit. I haven’t worked on it much but it’s pretty small so it shouldn’t take long. Luke is always so excited when I pull out Noah’s Sub, though, so I’ve been trying to work on it as much as I can tolerate. At back to school night I signed up to help in Luke’s classroom for a half hour each Monday. They break the class into three groups and rotate through “centers” Monday through Wednesday. I have the “art center” on Mondays. I am really enjoying my time in the classroom and it sure does make me look forward to Mondays, which is a new thing to me. I discovered another bit of evidence that I truly do live in the midst of retirement communities. I am acutely aware of this anytime I’m out driving or at the grocery store, of course. I recently discovered, though, that the Longs down the street from my house has magnifiers on cords throughout the OTC medication aisles. I actually think it’s a good idea it was just amusing when I first noticed it. Luke has decided to be a pirate for Halloween this year. So has his friend, Aidan. We trick-or-treated with them last year and it looks like that’s the plan again for this year. Well that’s all I’ve got for today. My blogging may be spotty again for awhile but I’ll try to post as much as I can. 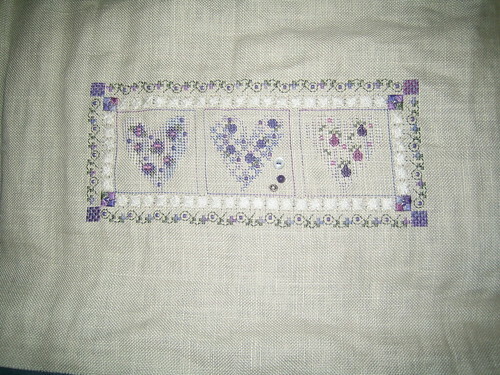 I finished something over the weekend, Gypsy Hearts by Shepherd’s Bush, so I took a picture. I spent all day Saturday doing Luke-related stuff…soccer in the morning, fair at his school, and two birthday parties in the afternoon. Sunday I went to church and cleaned the house, including Luke’s room. Nothing too exciting. It of course doesn’t escape my notice that today is September 11th. I suppose it would be impossible to miss that detail today if you listen to the radio, turn on the tv, check the news online, or whatever. I remember the day well because it was already a bad day before I knew about the attacks. Jay and I had been fighting the night before so he slept on the couch. I usually listened to the radio in the car on the way to work but I was really angry and listened to a tape of angry girl music so I had no idea. At work I heard what happened and they sent everyone home for the day. I spent the day at home with Jay and Luke, who was about 8 months old at the time. I remember being glued to the tv, not really understanding what was going on. It was the first time I’d ever seen continuous coverage like that without commercials. It’s strange to look back over the last five years and see the things that are different whether due to the terrorist attacks or due to time passing and life in general. I was such a different person five years ago. Jay and I weren’t married at the time and I was still painfully aware of how things looked, having Luke outside of wedlock and all. I wished so much for my life to be different from how it was. I wanted stability and I wanted to be loved and cherished. I guess I thought if we got married then that’s how things would be. I have spent much of the past five years finding myself and determining what it is I truly want out of life. I am no longer sad and insecure and I am over the concern I had with how things look to other people. I’ve had beliefs shaken and I’ve been humbled by my experiences. Sometimes I think God allows us to put ourselves into painful, complicated situations because the growth that occurs is necessary. I’ve certainly grown over the past five years. I hope I have learned from my experiences and that I can take negative things that happen and turn them into positive things. Well I have a lot more on my mind than that, but that’s all I’ll be writing today. Today is a day to remember what is important in life and focus on ways people can be brought together and differences overcome. Though really I suppose those things are important every day, whether the day is the anniversary of a terrible tragedy or just another regular day. I finally did it; I came up with a 101 things in 1001 days list. Everyone else did this ages ago and I never jumped on the bandwagon. Today is September 8th so 1001 days from now is June 5th, 2009. I’ll add a nifty counter at some point (and I’ll update my blog template at some point too…hmm, maybe I should have put that on the list!). 64. Pick a L&L piece to stitch first and start it…Firefly Fairies? Today I learned two things: 1. It can take a very long time to tune a piano when the piano tuner brings along an apprentice and 2. It is really hard to come up with a “101 things in 1001 days” list. I am stuck at 83 things. If I can think of another 18 then I’ll be posting a list at some point. Hopefully before I accomplish anything on the list because then I’ll have to come up with even more things. And that’s all I’ve got for today. I’m happy to say that I have power again (yay!) but my kitchen is considerably worse than it was last week since I haven’t been cooking and we had to move the fridge. The fridge is back in place now and I plan to spend at least some of the three day weekend cleaning the kitchen and the hall closet. Having a friend see the embarrassment that is my hall closet was enough to motivate me on that one (our breaker panel is hiding in there). My best friend, Maya, was down for the day yesterday. I took off at lunch and we spent a lavish afternoon together getting lunch, massages, manicures, pedicures, and blended drinks at Starbucks. It was my first “real” massage and wow. Definitely planning to do *that* again in the future. Spending the day with Maya was exactly what I needed and we have got to do that more in the future. She really needed the time away herself; she is a stay at home mom and, while she loves her son dearly, she said that she really needed the time away. While Maya was down she showed me what I think is one of the funniest things ever. Go to this site and watch the video on the left hand side with the treadmills: “Here it Goes Again”. I also like the one where they’re dancing in the backyard. I think they may be my new favorite band! I haven’t done much stitching this week. I have spent a fair bit of time dealing with the lack of electricity and then choir started last night. I missed choir so much during the summer; I am thrilled that it has started back up again. I am no longer the youngest member of the choir, though; one of my friends from bell choir has joined and she’s a couple years younger than I am. It was so great to be back singing with everyone; I can’t wait for the Christmas music to start. So that’s how things are with me. Luke is settling into kindergarten pretty well and he’s enjoying soccer. All but one of the kids on his team go to kindergarten at his school and it is so different from last season since he’s more comfortable with them. He still played last year but there is definitely a different dynamic. I’m looking forward to the three day weekend. I’m taking Luke to Legoland tomorrow, most likely; I hope it isn’t super crowded. Sunday I’ll be taking him to a co-worker’s pig roast (their annual tradition for the day before Labor Day) and I have no plans yet for Monday. I’d like to go for a “real” hike or at least a long walk and get a bunch of stuff done around the house. That’s about it! You are currently browsing the Jill's Blog blog archives for September, 2006.